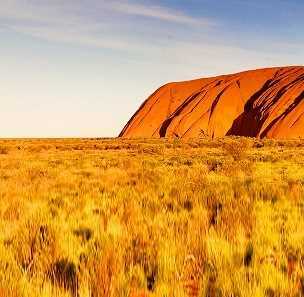 Uluru is from the Australian Destinations series (2013). It is a descriptive, expressive piece about the plains surrounding Uluru in the Northern Territory of Australia. This piece appeals to children of upper Primary school age as it describes the uniquely Australian environment that lies beyond the city, that is filled with colour and history: the plains being scattered with sea treasures, fossils and gemstones that have been buried deep within the sand, as the whole desert area was once covered by an inland sea. Vivid skies with colours changing, and the wind the only sound. Corama Uluru, Corama Uluru, Corama Uluru. Thousand stars in the night sky shining, and the wind the only sound. Corama Uluru (Aboriginal for ‘Plains of Uluru’) is suitable for upper primary or lower secondary school age children. It is available for SA & piano and is suitable for massed choir events. Corama Uluru teaches echo effects and simple canon techniques, harmonic blending, unison singing and explores the dynamic range of the voice. The words are easy to memorise.